« What a mess. What to do. Tomatoes are America’s most popular home-grown crop. 6 Things You Need to Know to Grow Great Tomatoes. Vining tomatoes are indeterminate which means they produce all season, need staking. Some indeterminate vining tomatoes are Early Cascade, Early Girl, Quick Pick, Better Boy, Big Girl, Delicious, Beefmaster, Brandywine most cherry types and heirlooms. Grow vertical, tower, Can remove suckers. 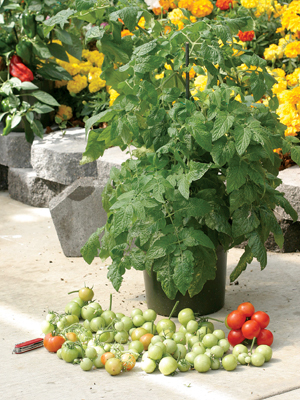 Bush tomatoes are determinate which means they are much more compact and grow and put out all at once. Rutgers, Roma, Celebrity are bush tomatoes. Only grows so high. Great container, patio plant. Removing suckers is not necessary. Tomatoes stop growing when the temperature is below 50 degrees and above 90 degrees. They can get sunburned. Protect them from hot temperatures over 90 degrees. If the leaves get burned they are now using all their energy to heal themselves and not making tomatoes. When planting tomatoes take all but the first 3 set of leaves off the plant and bury up to the bottom set. This makes more roots. The more roots you have the more plant you have. The more plant you have the more tomatoes you have. Nothing likes wet feet except bog plants. Keep Soil Moist but not wet. Water early morning so the plants have a chance to dry off during the day. Only water the roots. Don’t get the foliage wet. Water droplets can burn holes in the leaves. Moist, damp conditions promote fungus, disease and invite insects. Tomatoes are heavy feeders. Feed them organic fertilizer like worm tea, bat guano, fish emulsion once a week. To encourage root growth put a little Epsom salt around the plant. Magnesium sulfate encourages root growth. Healthy roots, healthy plant. Roses love a shot of Epsom salt too. Represented with numbers like 6-4-6. First number is percentage of N Nitrogen. This grows leaves. Makes plants grow faster and greener. Lawns like a lot of nitrogen. Tomatoes not so much. Second number is P phosphorus: Phosphorous aids in root development and increases flowering ability and bloom size. Bone meal is high in phosphorus great for bulbs and petunias. Tomatoes not so much. It is all about balance. Too much of a good thing is still too much. Third number is K Potassium or Potash. This aids stems and branches. The key here is a good healthy soil that has all the organic ingredients necessary. Make the plant work by giving it a healthy environment and it will thrive. Too much false stimulation from inorganic fertilizers like Miracle Grow makes the plants lazy and they become addicted to fertilizers and forget how to grow. Worm tea is alive with microorganisms. Works with plants and soil. Cover with at least 2 inches of grass clippings and/or wood chips. This provides weed control, nutrients and prevents water evaporation. Tomatoes, like onions, need at least 8 hours of sunlight to do their thing. Little food for thought: Tomatoes are by botanical definition a fruit because they have seeds, as do peppers, green beans, squash and cucumbers. Tomatoes got reclassified a veggie to avoid a tariff on fruit production. Oh well, that makes more sense at least when it comes to ingredients I would use in a fruit salad. Bon appetite.